Our “Captain” model is similar to our “Commander” but 3 inches thicker. This is our mid-level mattress for the serious boater. You and your shipmates will appreciate the sleep you get on this boat mattress, and will wake up feeling refreshed. The added 3 inches of support foam allows for two people, weighing up to 250 lbs. each to be supported properly without bottoming out. The “Captain” uses foam with a density of 1.8-1.9 lbs. per cu. ft. We’ve engineered this marine mattress to be the perfect balance between comfort and cost in an 8-inch thickness, where the height of the mattress isn’t a limitation. The “Captain” sports a sewn cover with a tape edge. 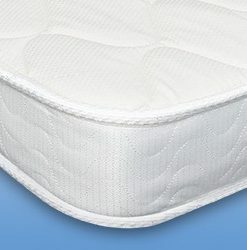 The bottom of the mattress cover is made from high-tech skid resistant material and the sides and top sleeping surfaces are constructed from high quality and attractive quilted damask. Optimized for the Perfect Mix of Support and Value—In order to keep costs down, we use a solid core of 1.8 density support foam in this mattress. 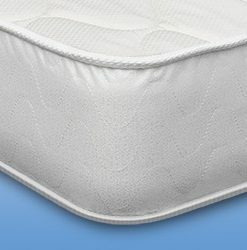 The density of the mattress core influences how you’re supported and how the mattress will hold up over time. 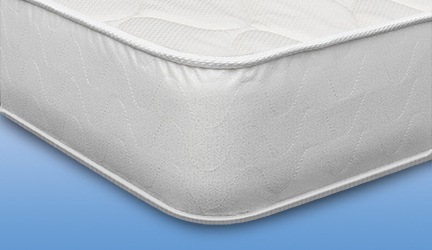 We believe that this marine mattress will provide you with optimal support, night after night. Many of our competitors use 1.3 to 1.5 density foams in their boat mattresses, which we feel is insufficient to achieve proper support, comfort, and durability. 8-Inches Thick—This is the optimal mattress height to maximize support—even for two people who each weigh over 200 lbs. “Medium-Firm” Feel—This is the best “feel” for most of us, or if you just can’t decide. If you’d like a softer top feel, you can easily obtain a customizable topper pad. This will give you options; softer when the topper is being used and firmer when it’s not. Motion Separation—Is your partner a restless sleeper? Our marine mattresses help to minimize the motion transferred when you or your partner is tossing and turning. This motion separation is more difficult to achieve without the proper foam core built into the mattress. Heavy Duty—This marine mattress is designed to last! The Captain is engineered to stand up to the environment on your sailboat, motor boat or yacht… hot, cold, air conditioned, or non-air conditioned. Have you ever thought about the environment inside your vessel when it’s not being used or in storage? It can be extreme! Our goal is to offer 5+ years of great support, and some of our customers are getting more than 7,8 and 9 years of use before thinking about replacing them. Thank you for such a wonderful experience! The new mattress is wonderful and it fits perfectly. We are VERY happy! Also, thanks for going the extra mile for us. It is much appreciated. I referred one of my boating friends to you. They may want a new mattress for their sailboat. Thank you for being a great customer and for taking the time to leave a review. We will keep an eye out for your boating friend for sure.